Many families consider switching to tankless water heaters since they provide hot water on demand and only when it is needed. They heat water on demand, as soon as you turn on a hot water tap. This means that there will be no waiting for a storage tank to fill up with hot water and a tankless water heater will deliver a constant supply of hot water in your home. You could also save money on your energy bills since a tankless water heater eliminates the need to continuously heat water when it’s not needed. And best of all? 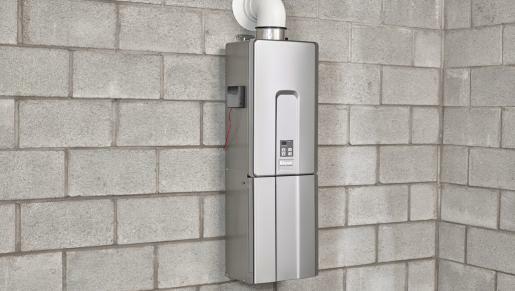 Tankless water heaters can be run from almost any energy source – electric, propane, and natural gas. It used to be true that initial cost of a tankless hot water heater was higher than that of the traditional models. However, the cost of these hot water heaters has come down recently. Plus when it comes to your energy bills, they can be up to 34% more energy efficient and help you achieve up to 50% greater energy savings. In addition, the life expectancy of these heaters is longer than 20 years whereas traditional heaters last 10-15 years. In the long run a tankless water heater is a no-brainer and will pay for itself. They are compact in size and take up less space than traditional water heaters. Smaller units can even be installed under cabinets, closer to the point of use. Less water is wasted since hot water is provided immediately and users don’t have to wait for hot water to reach a remote faucet. As long as a tankless hot water heater is operating within its capacity, it can provide an unlimited amount of hot water. Electric models don’t generate greenhouse gases. There is no possibility of unexpected flooding due to a ruptured tank. Ready to take the plunge? We put together our favorite tankless water heaters to make shopping easier for you. 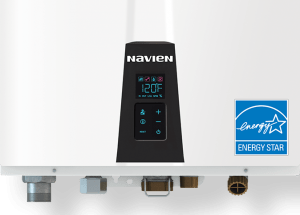 The Navien NPE-240a takes the definition of an instant hot water heater to a whole new level. First of all, it is a premium condensing model. This means that the model runs more efficiently and it condenses down the gas in your line to provide greater heating power. But, just because an appliance is efficient doesn’t mean it is not powerful. This Navien unit is one of the most powerful water heaters on the market and it can generate up to 12.2 GPM in flow rate. While this is a natural gas tankless water heater, this model can also be easily converted to run on propane simply by buying a $10 conversion kit. One of the top reasons for buying this unit is because of its advanced preheating technology that actually starts heating the water even before you need it. Other models allow you to use only as much hot water as the heater can provide which is indicated by its flow per minute. But, this model actually increases the temperature of the supply earlier to reduce the waiting time for hot water. Turn the water heater on and off. Set the Domestic Hot Water (DHW) temperature. Get statistics on total operating hours, the percentage of heating capacity, current gas usage, DHW flow rate, DHW set temperature, and inlet water temperature. We already mentioned that Navien NPE-240a is quite powerful. But, how powerful is it exactly? To be very precise, this water heater has a flow rate of 11.2 GPM at a 45 degrees temperature rise and 12.2 GPM at 35 degrees rise. Translated to Standard English, this means that the unit is so powerful that it could even please commercial users. When it comes to residential use, let’s just say that this unit will provide warm water for seven bathrooms and perhaps any other sink or appliance you may need for your day-to-day chores. And, what makes this tankless hot water heater even more amazing is that the hot water will be delivered instantly, the very moment you turn on the tap. As you already know, this model from Navien comes with many advanced features. But, don’t let this scare you. This unit is one of the few that combines advanced features and ease of use. The water heater doesn’t come with the traditional knob for adjusting the temperature. Instead, it comes with arrow buttons and a screen which makes the temperature setting such an easy process. If you are not that familiar with the build of a tankless boiler, here is one thing you should know. Tankless water heaters have one very important part which operates under harsh conditions – the heat exchanger. This part actually does all the work; it transfers energy and heats the water. So, not only does it have to be resistant to corrosion but it has to withstand mechanical and thermal stress. If you want your water heater and heat exchanger to last for at least a decade, then this part must be properly constructed. Navien made sure that it is. They made a stainless steel exchanger a part of their NPE-240a which has a very long lifespan, offers an efficient heat transfer, and is one of the most durable materials you can use for a heat exchanger. Knowing that your heat exchanger is made out of stainless steel will help you understand why this Navien model is energy efficient. Namely, stainless steel is very efficient when it comes to exchanging heat, allowing the Navien NPE-240a to reach an incredible 97% energy efficiency. The majority of water heaters can help you reduce your energy bills up to 20%. However, Navien takes the energy-saving game to a whole new level, not only because of the heat exchanger but also because of its ultra-condensing efficiency. Moreover, as soon as you turn off a water faucet, the water heater will shut down as well. This guarantees that there is no standby heat loss and makes the running cost of Navien NPE-240a ridiculously low. User-friendly design and ease of use. While still smaller than a traditional water heater, it is larger than many tankless models. Still on the fence? Check out our in-depth product review for the Navien NPE-240a. When you buy an on demand hot water heater, you will want your investment to last for as long as possible. If you invest money in a wrong system, either your needs will not be fulfilled or you will have to spend hundreds of dollars on maintenance costs that could have been avoided. If you want to make a wise investment then keep reading about all the benefits you get with Rheem RTGH-95DVLN. This water heater runs on natural gas making it one of the most energy-efficient models on the market, more reliable in the long run, and offers better performance in the cold weather. Rheem also offers the RTGH-95DVLP, which is the propane version of this heater. What makes this water heater amazing is its flow of 9.5 GPM which is quite amazing, but not as powerful as our top pick. Still, you could take a shower, hand-wash dishes, do laundry, and run the dishwasher at the same time. Another slight disadvantage of this product is that it is not smart home enabled, unlike Navien NPE-240a. But, don’t let this turn you away from buying this Rheem model. These minor disadvantages make the product more affordable than the Navien. And more importantly, this unit still includes plenty of advanced features. Since the Rheem RTGH-95DVLN runs on gas, it means that this inline water heater is energy-efficient. 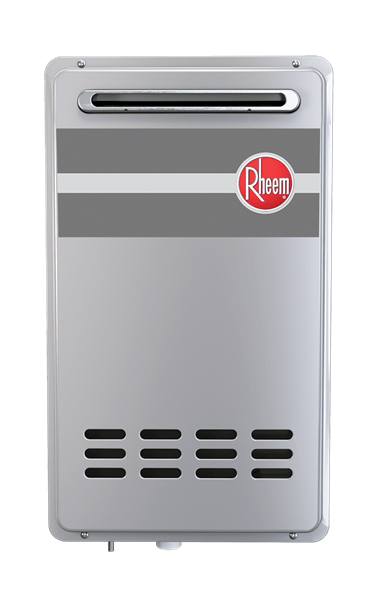 In addition, this Rheem water heater is also a condensing unit and it extracts heat from exhaust gases, making it much more efficient compared to the non-condensing units. This very model is Energy Star approved and has a 0.94 energy factor. This should help the buyers estimate how little power it consumes. The fact that the heater is made out of stainless steel ensures that no outside factors affect its performance. 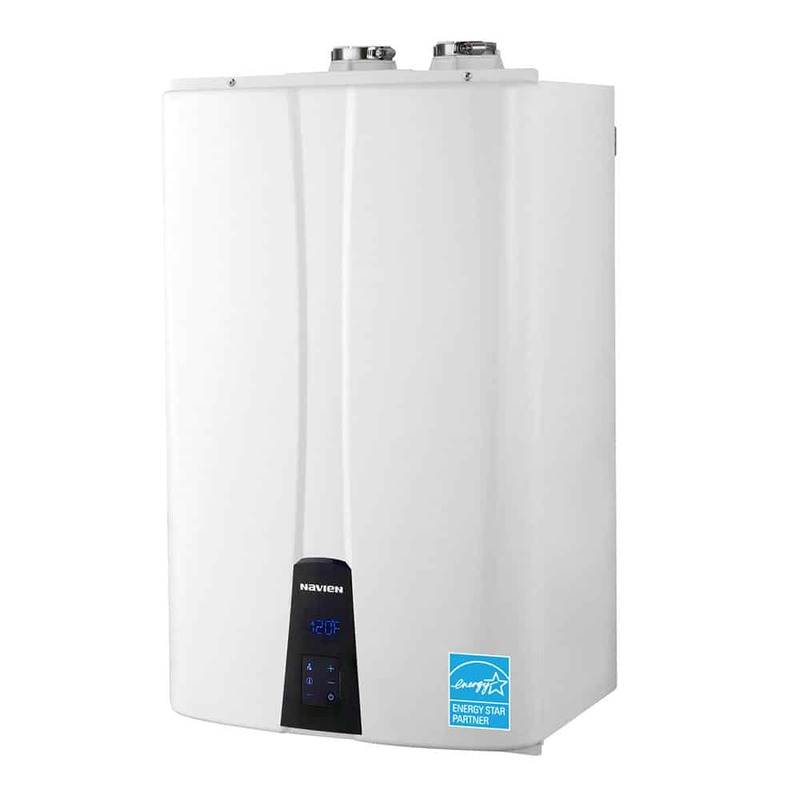 This unit is classified as a top rated tankless water heater thanks to its advanced features. The unit is a low-NOx model and comes with EZ-Link cable technology that allows the user to connect two water heaters that will operate as one. In addition, it comes with a safety Overheat Film Wrap (OFW) which is responsible for providing protection in case the heat exchanger breaches. One of the most important characteristics of this unit is the hot-start programming feature which reduces fluctuation in the water temperature. You’ll never fall victim to the cold water sandwich! One great thing about this water heater is that it comes with a self-diagnostic system which keeps the unit’s functions in check. This feature makes this tankless water heater very safe since it is very likely to prevent accidents. For example, if a problem with venting arises, the system will send a warning to the user. Talking about venting, the venting for the majority of water heaters is usually placed outside. However, Rheem’s venting can be placed both indoors and outdoors. A powerful unit with the flow rate of 9.5 GPM. A low-NOx model and a condensing unit. Installation is easy and instructions are included. Cheaper than the top pick. Still on the fence? Check out our top picks across all Rheem water heaters. The EcoSmart Eco 11 is an electric point of use water heater. In colder climates, it is perfect for point-of-use for a sink or any other appliance with low flow. However, in areas where the incoming water temperature is above 67 degrees Fahrenheit it could be used for the entire home. Its flow rate is 2 GPM, which is enough for running one shower head and a sink simultaneously. The flow rate makes this unit the perfect choice for small and mid-sized homes. On the other hand, commercial users and those who live in homes with three or more bathrooms should consider buying a unit with a greater flow rate. Since this model is electric, you don’t need gas, flames, nor burners unlike with the gas units. Also, it doesn’t require ventilation making the installation inexpensive and also very simple. Thanks to the unit’s compact size, it can be placed almost anywhere in your home. So, if you are looking for a high-performance, yet affordable unit, then this EcoSmart water heater should definitely be on your shortlist. As already mentioned, installing this unit is quite easy. You will need only a 60-amp power supply and #6 copper gauge wire. The unit comes with an automatic and resettable thermostat. This means that the heater will set the temperature automatically, making it very easy to use. Many users managed to install this tankless water heater by themselves. However, if you do so you might not be eligible for the product warranty, unless you are a licensed plumber. If you are not, it is recommended to call one and have him install the heater for you. If you are unsure where to search for plumbers, check out Amazon’s home services marketplace. Talking about warranty, it is good to know that if you use your EcoSmart Eco 11 tankless water heater for residential purposes your heater will have a lifetime warranty which covers the heat exchanger, electronics, and element. However, a licensed professional must carry out the installation for the product to be eligible for warranty. To see more details regarding the warranty, take a look at the owner’s manual. The fact that this unit runs on electricity doesn’t make it less energy efficient. If you want to save some money, cutting your electricity bill is a great way to start. According to the manufacturer, this on demand water heater can help you save up to 60% on your energy bills. The unit turns on only when a pipe goes on and turns off as soon as the pipe does. No standby time means lower monthly expenses compared to larger electric models with tanks. Compact size for easier installation. All components are made out of stainless steel or copper. The unit can be used for single or multiple applications. The flow rate is 2 GPM. The “point of use” design is not ideal in all circumstances. The heater must be installed by a professional for the warranty to be valid. Still on the fence? Check out our full product review of the Ecosmart Eco 11 tankless water heater. Need more space in your garage? 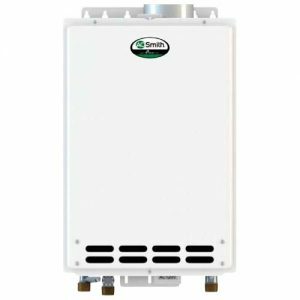 If you want to make a switch from a traditional water heater to an outdoor tankless water heater, here is one model you should definitely take into consideration. Rheem RTG-84 series is efficient, easy to use, and comes with quite a few amazing features. It offers models powered by both propane (RTG-84XLP) and natural gas (RTG-84XLN). The unit can provide hot water for a prolonged period of time and is powerful enough to supply several different appliances at the same time. All those who care about the environment will be happy to hear that this water heater is environment-friendly and meets the SCAQMD Rule 1146 requirements. The unit is quite durable and you can place it almost anywhere; both in low as well as high altitudes that reach up to 9840 feet above sea level. Since Rheem clearly always keeps the satisfaction of its customers in mind, they made it possible to connect this unit to another one with the EZ-link cable making them function as one. A temperature wire and a remote controller for easy temperature adjustment come with this product as well. The flow rate of this top rated tankless water heater is 8.4 GPM according to the manufacturer. However, it might vary slightly depending on some external factors (altitude, outdoor temperature) and the number of appliances demanding hot water supply at the same time. Still, the flow should be anywhere between 6.5 and 9 GPM. However, the flow rate should not concern you for residential use since it is quite unlikely that you will notice any difference below a usage rate of 6 GPM. It’s worth keeping in mind that the heater won’t turn on until the flow rate is 0.26 GP, which, once again, shouldn’t pose a problem to a majority of homeowners. When it comes to the heat, the standard rate is 100°F, but it can be programmed up to 140°F if necessary. Simply because Rheem RTG-84XLN is an outdoor unit doesn’t mean its installation is more complicated than that of the indoor units. It involves the same circuits and wires, as well as valves, vents, ground lines, amp breakers, pipe cover, and water heater connector. If you don’t have much experience with installing water heaters, then it is recommended to call a licensed professional. One of the most important things to keep in mind about this tankless water heater is that it must be installed outside. And no, a garage doesn’t count as outside. If installed in an enclosed space, the fumes released by the unit will build up and become a health hazard. However, this water heater is a “low NOx” model. It forms and pumps fewer gasses and fumes than many other models. The ones that are produced pass harmlessly through the vents and into the atmosphere. Minimum flow rate is 0.26 GPM. Flow rate might vary slightly, depending on external factors and simultaneous usage. The Eccotemp FVI-12 is an affordable yet powerful unit. Other than the price, there’s nothing cheap about it! It is an indoor tankless water heater with a flow rate of 3.4 GPM. This rate is sufficient for small and medium-sized houses, cottages, and cabins. There are two models available, one powered by natural gas and other by liquid propane. The manufacturer offers a 2-year warranty on all parts of the unit including the heat exchanger. Both models are highly efficient and can help you save a considerable amount of energy. In its idle state, this heater consumes about 2 watts of power and 10 watts when it is functioning. So, the unit can provide a continuous supply of hot water while using a minimal amount of energy. The liquid propane model comes with a stainless steel vent kit that provides a thorough venting system. As we already mentioned, this water heater can meet small and medium hot water requirements and more than one hot water application. Besides being capable of supplying small homes, the Eccotemp FVI-12 will fit perfectly into any space. Its dimensions are 4 x 15 x 24 inches and it weighs only 20 pounds. The unit comes with an electronic ignition system increasing the safety of use of the product. This water heater uses a standard 120V electric outlet that comes with a UL listed cord. The powerful ventilation system makes sure no hazardous fumes remain inside your home. In addition, both models come with a digital display and independent water and gas control systems. This Eemax on demand hot water heater is an electric unit that can provide hot water continuously. The unit is recommended for point-of-use applications but it can also supply an entire small house. It has stainless steel casing which prolongs its life expectancy. In addition, this Eemax model is covered by a 1-year warranty. The unit is built only for indoor use. It features a modern look, and its small design allows simple installation under a sink or inside a cabinet. The unit weighs only about 5 pounds. The flow rate of the unit is 4.8 GPM. Eemax tankless water heater is equipped with the immersion type copper heating element. Such heating element heats up water with 99% energy efficiency since all the power is used only for water heating. So, there is almost no standby heat loss which is not the case with traditional water heaters. 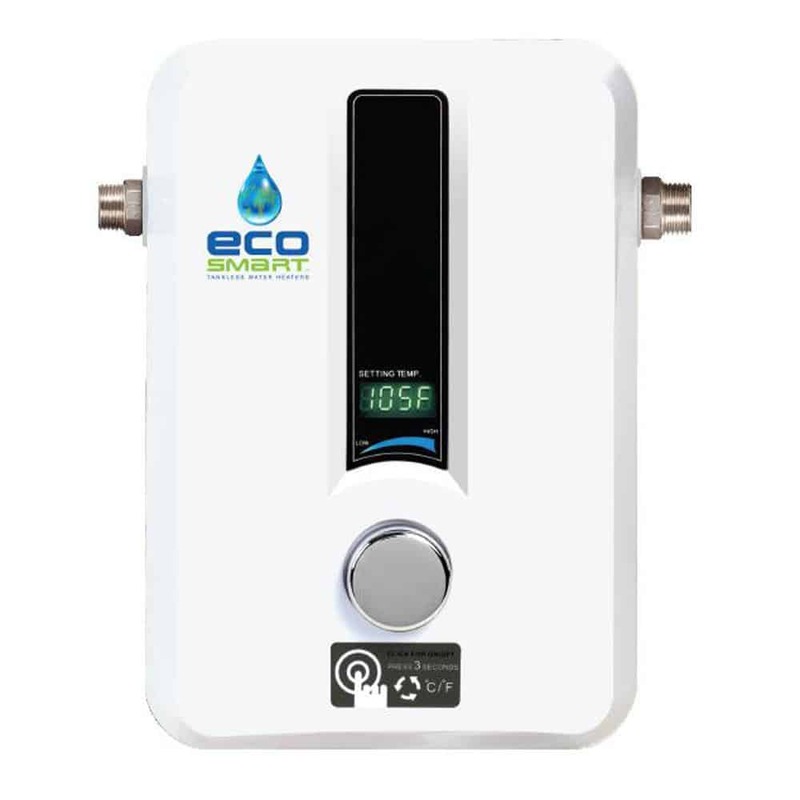 This Eemax tankless water heater comes with a few innovative features including temperature sensors, advanced water flow, and computer controls. All of these elements work together to maintain stable water temperature and minimize fluctuations. Here is how the heater functions – heating element heats water as soon as you turn on the tap and a flow switch is used to activate the unit. Thermostatic control of the water temperature and adjustable settings maintain the water temperature which can be adjusted. The user can use a dial to change the temperature from 80°F to 140°F. This unit also ensures reduced calcification, liming and sedimentation. All Eemax models are pretty safe for use since the risk of high water temperatures which can result in burns are reduced to a minimum. This is achieved with a scald prevention system as well as computer controlled micro-processing temperature control. Rinnai RL75i belongs to the “Luxury” series. There are two models available, one that runs on natural gas (Rinnai RL75iN) and another that runs on propane (Rinnai RL75iP). These units are highly efficient and Energy Star approved with 0.82 energy factor. Homeowners can increase their savings by up to 40%. Both models are designed for indoor use and they come with a concentric vent-type venting system. This system features one pipe for getting fresh air from the outside and another that serves as an exhaust. The manufacturer offers a 12-year limited warranty on heat exchanger and 5 years on other parts. 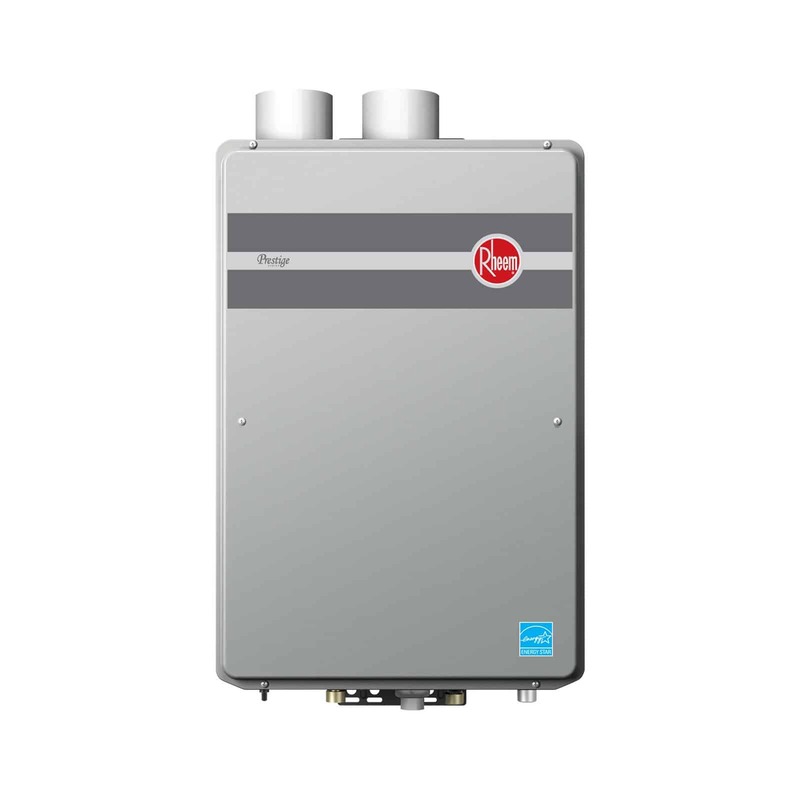 These Rinnai units can definitely be considered one of the best tankless water heaters on the market. Their flow rate is 7.5 GPM, which is high enough to supply a home with up to three bathrooms. The minimum water flow required for the activation of this heater is 0.4 GPM. A 24-hour programmable digital controller comes with the unit, allowing the user to schedule more than one operation during the day to meet different usage patterns. Rinnai RL75i models are very small in size (14 x 22.9 x 9.6 inches) and can be mounted on walls or inside a cabinet. They feature a sealed-combustion system with a zero clearance, which means that no hazardous fumes will find their way inside your home. 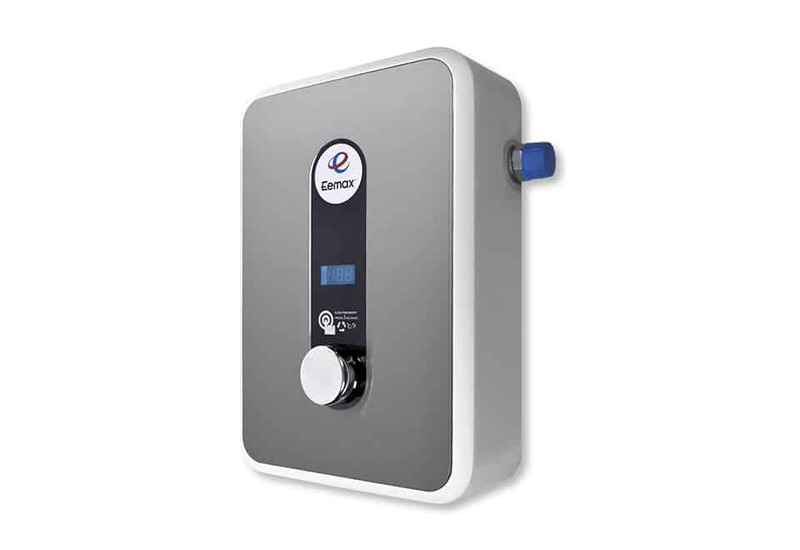 The water heater features EZConnect system which enables two identical models to be connected into one system and provide an even greater amount of hot water. Rinnai also thought of its commercial users since up to 25 tankless heaters can be connected. 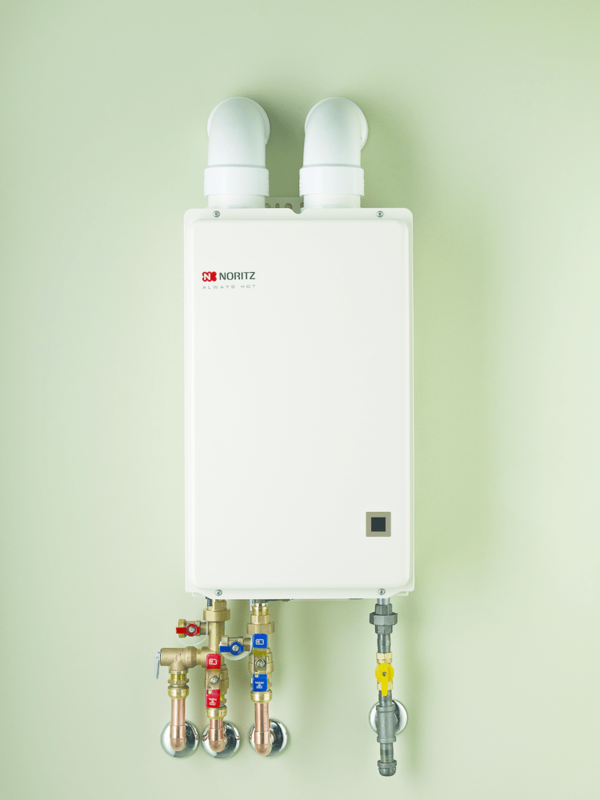 The Noritz NRC-661 is a condensing tankless hot water heater that is suitable for small homes. The unit runs on gas but actually uses electricity for ignition and to power its electronics and other internal components. The unit is meant to be installed indoors and it uses a direct vent kit. However, a non-direct vent conversion kit may be purchased in case you need to mount the water heater on a non-exterior wall. One great thing about its unit is that it doesn’t need electricity all the time in order to work. The unit can be connected to a battery backup so you can use it if a power outage occurs. The unit is energy efficient (93%) when it comes to gas. However, it can also consume up to 138 watts of electricity when the unit is running in antifrost mode. In addition, the unit’s NOx emissions are low, but not low enough to meet the industry’s standard for a “low NOx” model. Noritz could be considered as one of the best water heater brands, and in order to justify this, they try to make high-quality water heaters. That is why this unit comes with two heat exchangers that are made from commercial-grade copper, which is thicker than regular copper. Both exchangers are covered with a 12-year warranty. In addition, the unit comes with certain advanced safety features such as freeze protection, flame sensor, overheating and lightning protection devices, and temperature control lock. The unit’s flow rate is 6.4 GPM and the minimum flow required for hot water is 0.5 GPM. But, the peak flow rate will only be delivered when the unit is increasing water temperature by 30°F. A 70-degree rise will cut the flow rate in half. This means that, at such a rate, you will be able to use only two faucets or two showerheads at the same time. This model can heat water to temperatures ranging from 100 to 140°F. 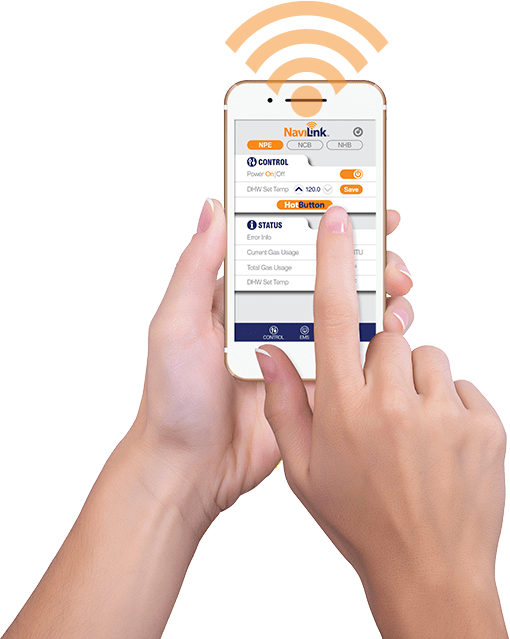 In addition, there is a remote control that allows you to choose from nine different temperature settings but you will have to purchase it separately. The AO Smith ATI-510-n is one of the best tankless water heaters made by this manufacturer. This unit is characterized by reliable operation and endless hot water supply. To ensure efficient operation of circulation pumps, the manufacturers made sure to include a pump control port. It is fueled by natural gas and can be used both for residential and light commercial purposes. The unit is capable of handling even heavy-residential usage such as space heating. This model uses HRS (heat-resistant) copper alloy for the main exchanger and a thicker heat exchanger. The unit is also non-condensing one and it has a high energy factor of 0.82. It will use up to 199,000 BTU/hr of natural gas to provide hot water for a home that has up to four bathrooms. The flow rate of this unit is 10 GPM. Just in case you need a boatload of hot water, you can link four of these units together. But don’t let its power deceive you. The unit is still compact and easy to install. When it comes to installing, there are three options for you to choose from: installing the unit indoor, outdoor, or choosing direct venting. 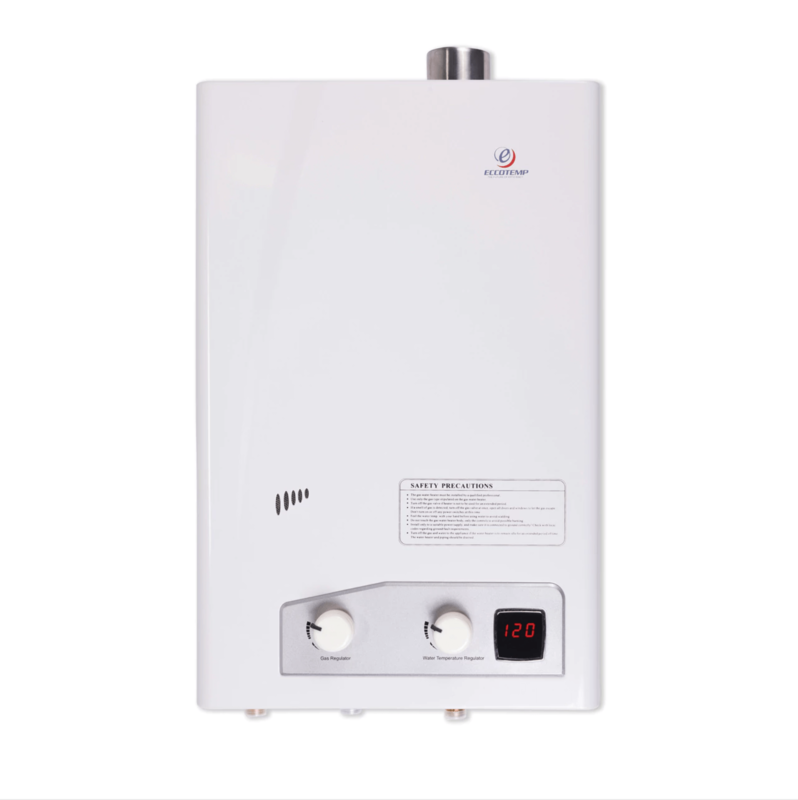 In addition, this tankless hot water heater is covered by a 15-year limited warranty. 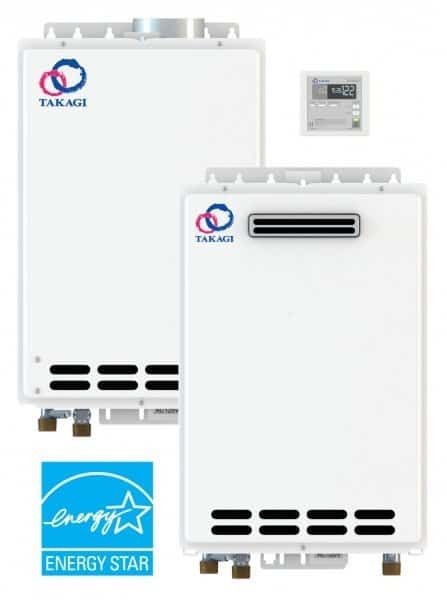 Takagi is a respected name in the tankless water heater industry, even though it is not as well-known as Rheem or Rinnai. The T-KJR2-OS-NG water heater is very compact (6.7” x 13.8” x 20.3) and you can install it anywhere. Just, make sure that you do that outside. This model has a maximum flow rate of 6.6 GPM which drops as low as 2.5 GPM in cold weather. Therefore, in warmer climates, it can supply two bathrooms with warm water. On the other hand, in a colder climate, it is appropriate for small homes with one bathroom. Still, this model has the same capabilities as a traditional water heater with a 40-gallon tank. The unit operates at 82% energy efficiency and uses up to 140k BTU/hr. Besides heating your water, this Takagi outdoor water heater can also support radiant floor heating applications and hydronic baseboards. How does an on demand hot water heater work? All the promises that come with best tankless water heaters, such as energy savings and unlimited hot water, will only be fulfilled if you buy a unit that is compatible with your needs and your home. In addition, you will somehow how to find an ideal balance between price and functionality. One important thing you should take into consideration is the size of your household. A small apartment doesn’t need the same GPM output from a water heater as a three-bathroom house. Think about your GPM usage. Check your shower (the appliance that has the largest hot water demand), sinks, and also other appliances such as your dishwasher. After doing this, try to determine how many of those feeds you use simultaneously and what would be the total GPM. It is recommended to round up by about 50% of your requirements so you could give yourself an appropriate margin of error. The next thing you should keep in mind are installation costs. Installing a tankless hot water heater all by yourself can be quite difficult. It is always recommended consulting a qualified professional even before buying a water heater, so he could inform you about the installation cost based on your needs. Amazon’s home services marketplace makes it easy to find a local profession to install your water heater for you. If you buy an indoor unit, then you will have to make sure it is vented. And, an outdoor unit must be weatherproofed. That is why tankless water heaters tend to be more expensive. But, if you choose the right unit for your home, it will eventually pay for itself. Once you are aware of your flow rate and potential costs, you need to decide whether you want your water heater to be electric or gas-powered. It is very likely that you will need to upgrade your electrical system or your gas supply line as well as venting. When it comes to buying an electric tankless water heater, your primary concern is the load it will place on your home’s electrical system. These units are perfect for point of use, and sometimes you can get away with a smaller whole-house unit without having to get any electrical upgrades. Most homes have 100 or 200 amp electrical service which is suitable for electric tankless water heating units. But, if your home’s electrical system is underpowered, you will need to decide whether the cost of upgrading is worth it. All electric models have the number and amperage of breakers required clearly specified. If you are not familiar with your home’s electrical system and whether it can support an electric water heater, consult an electrician before buying. On the positive side, electric units don’t need venting and this will save you money, space, and time. On the other hand, a gas on demand hot water heater is typically more powerful and more suitable as a whole-house water heater. But, your gas supply must be large enough to power the unit. It is recommended to call your gas provider or a certified plumber to help you determine where your unit should be located and how much gas is typically used in your home. Another thing you should pay attention to is venting. A tankless gas water heater requires large, stainless steel vent pipes that can withstand very high temperatures. So, instead of re-using the venting from your old water heater, it is recommended to upgrade your venting if necessary. In addition, you should also look for a model that uses electronic ignition devices that reduce the fuel consumption. Luckily, the majority of recent models come with electronic ignition devices. 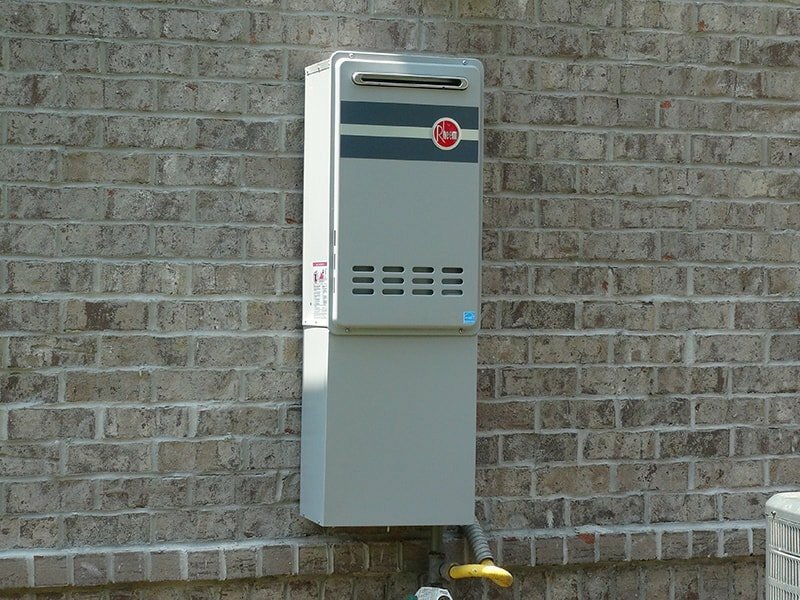 If you are not a fan of upgrading your electrical system or changing your venting, you can always consider buying an outdoor tankless water heater. These are usually gas-powered units that are weatherproofed so they can withstand all the outside elements. In addition, they typically come with a freeze-protection device. Outdoor units will not take up any space inside your home and they can save you some money by cutting out the costs of venting. However, these units might be a bit more expensive than the indoor ones. 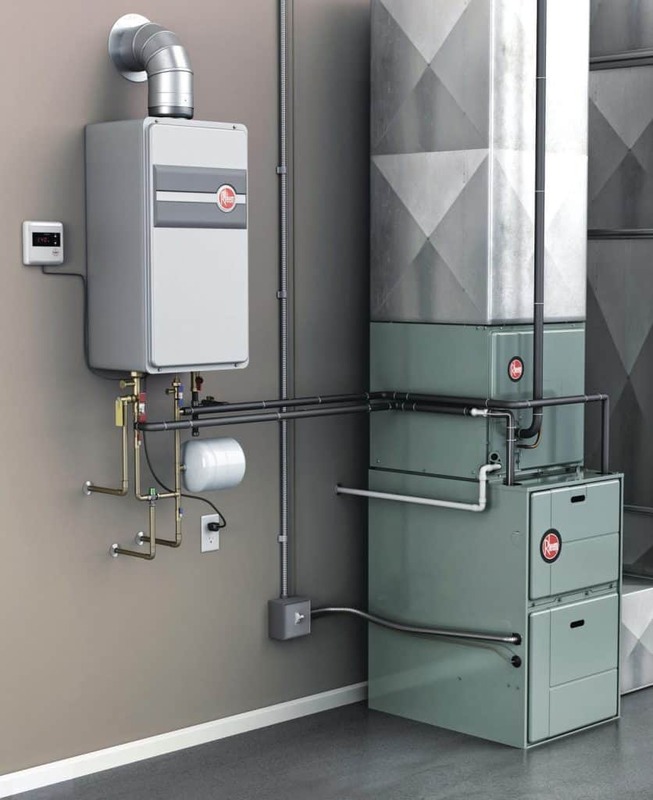 Last but not least, many models of gas tankless water heaters can be connected to your heating system. And, once they are connected, that should make them compatible with any other smart home devices that you own such as a smart thermostat. However, some systems will only work with a thermostat from the same manufacturer. Also, keep in mind that electric water heaters aren’t connected to a heating system and this makes them incompatible with smart home integrations.